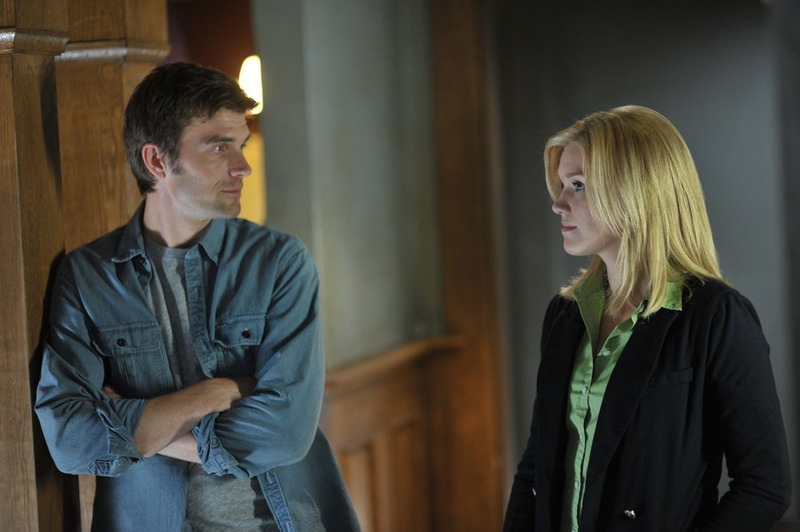 Here is part 2 of the interview with Haven stars Emily Rose (Audrey Parker) and Lucas Bryant (Nathan Wuornos). Check back tomorrow for parts 3 and 4. Isn’t this old photo enough to make you want Audrey back? You previously discussed the double-episode shooting format. Does that mean that the “Trouble of the Week” will also span two episodes? Lucas: Yeah, it’s kind of worked out that way. Sometimes there are multiple Troubles or situations that are spun out over the two episodes. It seems like in order to shoot 26 episodes this season that was the smartest way to get it done. A happy accident, well, not necessarily an accident, a nice product of having to do it that way has been what we’ve gotten to do storytelling wise. There’s a lot more character interaction and time to really see how these things affect these characters. The part that I enjoy, and I’m sure I can speak for Emily, too, is getting that time to not just have to run from one fire to another, but to get to rest a bit and learn more about where we came from, where we’re going, and why. Emily: The cool thing it offers, also, is a big reason for viewers to come back each week and watch what’s going to be happening. It links two episodes together. Before there was an underlying mythology, but now you add the Trouble as a cliffhanger as well. It really ups the stakes for, “I want to be sure that I come and watch it live” so the ratings are awesome every Thursday night. Lucas: It has been a series of cliffhangers, hasn’t it? Is there an overall theme to the season, and, if so, what is it? Emily: Um… There is definitely. I know that the writers have a grouping of what these first a and b seasons are. [conversation on the side] I’m conferring on how much I can say about this right now. They definitely have different blocks and themes. The first one’s a fight to try to get Audrey Parker back. Whether or not that’s the theme for every single person…I don’t think so. Emily: Cause he’s a love sucker. We’re just now embarking on our filming of the second half of the season. That already feels different, which is exciting. I was a huge Lost fan, and I remember when they discovered the neighborhood that was on the island and there was this whole other group of people that existed – it just sort of shifted your whole, entire perspective of what was going on. It’s exciting when shows can do that. There’s kind of that feeling – not like that at all in terms of the neighborhood thing – but there’s a feeling like that to the back half of the season that will take on its own voice and tone. It’s only in looking back at the first season that I can get a vibe for what that is. It doesn’t feel theme-y per se. Lucas: Right, right. For Nathan it’s always about the same thing – it’s always about getting him some more Audrey Parker. But, like Emily said, there has recently been a huge shift in our world and that’s an exciting journey we’re about to go on. Emily: Not to speak too much about Audrey specifically, but we haven’t seen Audrey for how long now? Since the end of season three – Audrey proper. Last season, she was a Lexie/Audrey hybrid, sort-of. That whole hunt for Audrey 1.0 is, for me personally, I really do and really was missing that original Audrey for some reason. I don’t know why, but I was. It may be a strong pull for viewers to see that. You’re filming the second part of the double season now, have they told you what’s going to happen at the end? Emily: We don’t know “at the end.” Currently, Lucas knows a bit more than I do because he’s getting to begin with his directorial debut the second half of the season. I’m super stoked. I feel like a kid waiting for Christmas morning. I don’t know why, but I keep asking him, “What are you doing in director land today? How was prep? What’s it like? What’s going on? Have you heard anything? Do you have your script yet?” It’s very exciting. In terms of what we’re going to get at the end of the show, the writers are always very reluctant to give us any of that information. If you want any spoilers, you have to get them out of Lucas because he knows the most. Lucas: It’s only like another inch of information. I don’t have any keys to the kingdom. I don’t have a clue where we’re going to end. Emily: They’ve always said that they know the final frame of the season. I sort of feel like we may shoot what that is and we may shoot an alt or something because there’s always hope that we’re going to come back for another season. Emily: It’s not done and done at all. They know the end of it, but they’ve never told us what that is. Have they said whether fans will like it? Emily: They’re always sure that the fans will like it. To give them credit, they’ve been pretty right. Something that’s been kind of crazy this year – an interesting phenomenon – is that we have had lots of people, and meeting fans and visitors. Something that has been a cool observation, I think, has been the range of age groups of fans. We have fans that are 7, 8, 9, then I think I met one of our oldest fans the other day who is like 83. We have mothers and daughters, husbands and wives, the teenager crowd, and adults. We have a list of people here: Australia, Germany, UK, Sweden, Monaco, France, Ohio, Florida, Illinois, Arkansas…all over, they come from all over. The coolest thing I’ve realized – we’ve fought all these years for little details here and there – the network and writers and everybody has a really amazing pulse on a story that seems to appeal to a wide group of people. When you say, “Is it something the fans will like?” I sure hope so. Our fans are pretty awesome. We really get each other. Lucas: That list of people, those aren’t just the places that we have fans. Those are the people who drove here or took a plane. Lucas: …traveled across the world to come and see this part of Nova Scotia where we shoot, which is quite an honor.